As a long-time proponent of alternate schooling, I was stirred to read Gatto’s essay Confederacy of Dunces. It’s a little on the long side, but worth the read. A breathtaking image. I’m wishing I was there. 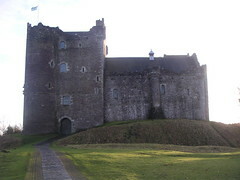 Our UK correspondent tells us that Doune Castle (pictured here) was used in the filming of Monty Python and the Holy Grail. 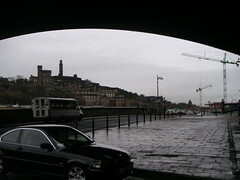 Click on the photo to go to his Flickr page, and view some stunning images of fog-shrouded Scotland. 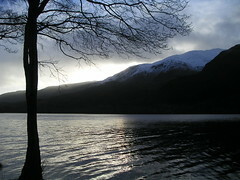 Alex has posted some snapshots from his UK travels on flickr.com. If you click on the photo, it should take you to his photo page. These photos take me back to my own first visit to the UK, which was another January some 30+ years ago – rainy, cold, damp, COLD, but still very exciting. I’ve spoken with Alex, who reports he’s having a great time. Check back for more photos in the coming days. 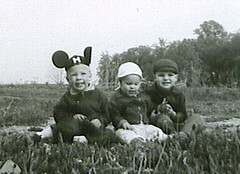 While I was abroad, my mom sent me copies of several photos she’d just scanned, including this shot of me (with mouse ears! ), my sister Cindi and my cousin Chuck. Happy times! 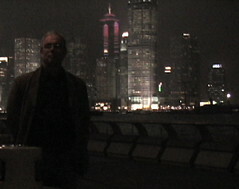 Back from Hong Kong for a few days now, and I’ve got a new PowerBook to edit the video I shot there. This image is a frame from some video I shot on the waterfront of Victoria Harbour on my last night, just before watching the Symphony of Lights (see previous blog entry). In the background, the International Financial Center and other buildings of the Central District. Well, first I must fess up and acknowledge that this is not my photo. I do have about 10 minutes of video of the Symphony of Lights, however, which was a splendid finale to my stay in HK. The crowd gathered at the harbour’s edge in front of the Convention Center a little before 8, and then the whole skyline went crazy with a synchronized music and light extravaganza. I was curious how they did it and looked up the site of the company that created it. 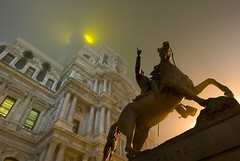 In Philly they tried to make a honk and toot out of lights on one side of City Hall. Fugeddaboutit! This is the real deal! Once the show was over, I slipped into the Grand Hyatt – close by – for something in a snifter and some loungey jazz stylings. The hotel lounge is grand and the sofas extra comfy. Life in HK has been good. Now for the long long ride back to home – reality awaits in the City of Brotherly Love at the end of a 20+ hour journey. 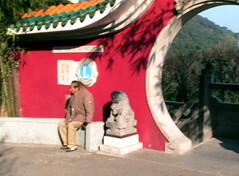 This one’s for Mom and Chuck – the Hong Kong Lions are the sponsors of this location on Victoria Peak. When you pass through the round portal, you walk out onto a balcony with a killer view of the city. Originally uploaded by angus mcdiarmid. One more photo I didn’t take, though I was in this tram car and saw this view. 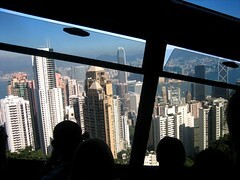 Angus’ photo is better than mine, though – you can sense the tilty tram car and the dazzling view below. You are currently browsing the CHAZZY(BLO)G blog archives for January, 2006.